Imagination Station books rarely let you down and this one was no exception. Filled with history in such a way that kids can not only relate to but hold onto, this book was a delight to read. 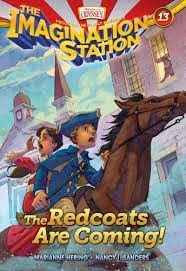 Each of the books takes you through a different historical period and this one about the revolution was not only easy to read, but held our attention to the very end. The fact that it's the first book in a three story arc is almost a bonus! It means there's more to come!